Get ready GIRLS! head to your nearest Shu Uemura store and check out the "holy grail" cleansing oil which is the talk of beauty bloggers! don't know what this "cleansing oil" is about? well go get a demo done & you'll be given a 3-day sample to try at home! Not only that, if you purchase any cleansing oil (150ml) you'll receive a free 4 pcs travel set worth RM119! AND if you are really a freebieholic! join the email your friends contest to tell them all about the Shu Uemura cleansing oil and u might win one to use! wat is the 4pcs gift given out? i was just at 1u, the girl say only buy the small bottle cleansing oil (100ml) cna get the 4 pcs liao..
sorry Gossip.. i went back there again after work and this time the sales girl told me another story again.. and no eyelash. Eyelash only for DIGI USERS WHO RECEIVE THE SMS. It's so frustrating that their own STAFF/COUNTER/SHOP don't know their own promotions that's going on. Mislead me from LUNCH until AFTER WORK on the promotions. I have had it with them at 1utama, I don't even have the energy to inform their management that their own staffs don't know what promotion is going on, had the decency to tell me from A->B->C promotion story. In the end I just gave up and didn't purchase anything after given the big run around. 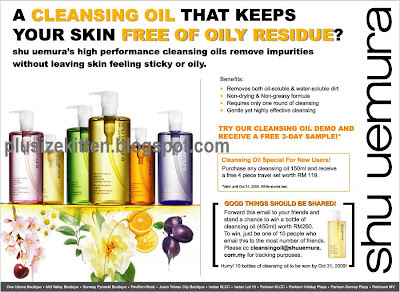 I SUGGEST ..everyone to PRINT THE BLARDY POSTER that's been circulated by SHU UEMURA to the shops to show them that the email advertisement say BUY ANY CLEANSING OIL GET 4 PCS GIFT! the irony is when I told the sales girl that i receive email, they don't know what "email" i'm talking about and neither do they know "what promotion is that". They will quote u DIGI promo etc and think you're dumb?! or at least that's HOW I FEEL AFTER BEING GIVEN THE RUNAROUND and in the end have the CHEEK to layan me like a fool after i said I don't want to purchase it anymore since i don't get eyelash. WOW u know what the bloody sales person do? just snobbishly agree that I should'nt purchase! $%%^&^&^&*? what the hell? mislead me and don't know her own facts right and treat customer this way? They also blame their OWN MANAGEMENT for sometimes "Giving ERROR on promotions". There u have it, Malaysian Sales People.. U.S.A (unprofessional sales assistant). Come to beauty expo and buy something else le.